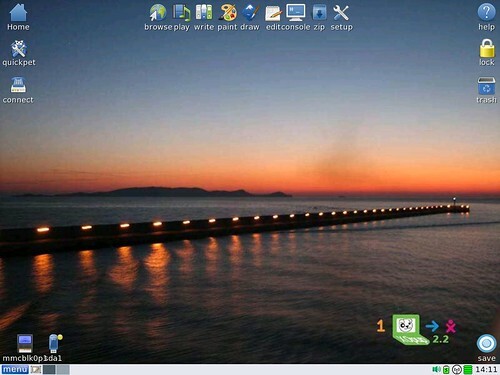 Find ALL Puppylinux builds for the OLPC XO-1, XO-1.5 and XO-4 collected HERE by "ally"
Paul J Fox (OLPC) was critical in debugging and modifying power management and keyboard function in XOpup. Anna and Eddie Owens helped with the sound at the initial steps of the project, and ttuuxxx had many helpful comments and encouragement during the difficult start. New initrd/init and rc.sysinit scripts for faster boot (by 10-20 sec, depending on the setup). Please do read the build announcement and the change log for the numerous new features and functions. To install XOpup-2.2 download the XOpup-2.2.tar.gz file (md5sum: a05a34ba7ddac575cba785eedcad5479), expand it at the root of an ext2/ext3/vfat formatted USB or SDcard and boot your unlocked XO-1 or XO-1.5. Shinobar's new "sfs_load on the fly" for loading and unloading sfs without reboot. Many more updates and under-the-hood changes. See the change log for the changes from XOpup-2.0. To install XOpup-2.1 download the XOpup-2.1.tar.gz file (md5sum:800b9351753fe792a5e14c5c39e0fe16), expand it at the root of an ext2/ext3/vfat formatted USB or SDcard and boot your XO-1 or XO-1.5. Do see the Build Announcement for more info requirements issues etc. Oct 18, 2010: This is it folks XOpup-1.0 is out[/size]. More informative battery monitor, new airplane mode, pupdial that works with 3G modems, fixed UI in pupradio, hardware/setup-aware first-run screen, improvements in the package manager, etc. Major stability improvements in running from a lupusave file with new kernel, aufs-utils, and power management. See here for more details. The links below have been updated accordingly. XOpup-1 is based on Puppylinux 5.1.1 with several customizations to fit the hardware. In addition to the custom kernels and under the hood optimizations, it includes custom desktop, quickpet, first-run screen, battery monitor, touchpad widget for XO-1, swap-file maker and power management. It also includes other goodies like the free-memory deamon, the lupu-511 "light" version of the Midori browser as default, and all the standard Puppylinux 5.1.1 applications and programs. expand it at the root of a VFAT or etx2/3 formatted USB stick or SDcard, load the stick/card on the XO-1 or XO-1.5 and boot! The same file should be used for both the Geode LX800 XO-1 and the VIA C7-M XO-1.5 models as well as USB sticks or SDcards, without further modifications. Please test (specially if you have an XO-1.5), fix ( ) and report problems here. Any updates to anything I have contributed will appear here. I just went through the rigmarole of updating the firmware to q2e45. My xo-1 wouldn't work with an SD card, but was booting fine with usb sticks. For those unsure, in the build announcement there is a link to the q2e45 firmware update instructions..
Below is a web cam app called guvcview. It needs dependencies, jack, libv4l, portaudio, SDL.. I packaged them togrther for convenience, enjoy! Um.. double post.. maybe it was meant to be? a fellow puppian send me a PM that I deleted by mistake before I had the chance to reply or even see, and I do not remember the username. Pls send again if you want. I untarred the tarball to a blank ext2 formatted usb stick. It boots into the RC of Puppy for the OLPC but doesn't enable the created swap file; likewise, the pupsave file dialog is not presented so the pupsave file is NOT created. Of course, when I reboot nothing is saved from the previous boot session. When I issued the free command on my XO-1 (256MB) very little RAM was available immediately after the initial boot session. BTW, the previous V3/V4 Puppy installs on this XO-1 worked better than anything I had used prior. Do you by any chance had already a lupusve.2fs (or .3fs) file in your stick? A previous lupusave can not be used with different versions but during boot puppy sees it and thinks it's OK. The first time you boot XOpup-1.0 and then "Menu->Shutdown->Poweroff computer" will (should unless you already have a lupusavefile) ask you if you want to save the session, and how. Does it? If not, look for two things, either a lupusave file or (if you ever used XOpup and saved to the entire partition) for the invisible ".wh..wh....." folders. Try "ls -a" to see them. Erase them and start over. If you have already settings in the old lupusave file that you want to save (like firefox setup and bookmarks), rename the lupusave file to something like "lupusave._2fs_". Then boot XOpup-1 make a new lupusave or save to the partition. Normally all the user data are in the /root folder. Copy them bach to your new root folder. Do not copy everything. Just what you want. Hmmm... it looks like that depending on the USB kind/brand you can have this problem of not saving in the first session. Finally the third ext3 (actually a 4GB kingstone SDcard mounted either at the SDslot or at the USBport with an adapter) gave the "not saved session" problem. Could you please verify that the same stick was ok with v3-v4 and no reformatting or anything else changed in between? Apparently there is a number of changes in rc.shutdown, function4puppy(4), snapmergepuppy (other?) in lupu510 vs lupu-511 that could account for this issue. We need to look at it, but for now all I can say is try another stick card. Subject description: Report of which stick I am using. The stick that worked with V3 was a Kingston 4G Datatraveler model DTI/4G ext3 partition. The stick I loaded the RC on was a Kingston 8G Datatraveler model DTI/8G ext2 partition. Update: Loaded V4 on the 8G stick (the one that did not work with RC) and the pupsave file and swap WERE created. The two were purchased a few years ago within a few month of each other. I loaded it on the 8G stick because I wanted to make sure everything worked and if it didn't I would revert back to the 4G stick with V3. I have an external USB hub attached to one of the XO-1 USB ports with an external mouse/keyboard/wired ethernet attached. I must unplug the USB hub when booting from the 4G Kingston (using V3) until the boot process starts; however, using the 8G Kingston it boots with the USB hub attached. I did try booting the 8G Kingston (RC installed) with the USB hub NOT attached to verify that didn't have anything to do with the pupsave not being created on shutdown. Maybe it is time to buy some new SDHC cards to experiment with. Wish I knew which ones worked good with the XO-1. I have read that the SDHC read/write speed is not very good on the XO-1, so paying a premium price for a class 10 might not be worth it. Could buy a few class 10's and use them on my ASUS 904HA and use the old ones for the XO-1. I loaded V4 on a 16G Apacer SDHC card and it worked for awhile then became flaky. I had this same problem when I loaded Ubuntu on this Apacer stick over a year ago. The 16G Apacer is not recognized reliably on my other laptops either. The Apacer is a Class 6 P/N-AP16GSDHC6. Don't know much about the Apacer brand maybe not a good brand? I know this is getting long. You mentioned loading Puppy onto a FAT16/32 stick works but the pupsave file save time at shutdown is VERY long. I have booted many USB sticks using the factory fat16/32 file system with Puppy loaded onto my ASUS and have never had long save times on shutdown. Any further information/pointers to further information regarding the slow save time would be appreciated. if you come across these misbehaved media that do not want to save the session after the first boot, because Puppy can not determine where they are mounted, just tell it! In traditional Puppy you have the boot options. In XOpup these options are passed by the command line arguments of the /boot/olpc.fth file. All my "non saving" media where OK with this. Is not as "automatic as we would like it but the diversity in flash storage media is really big even between the same product of the same company! mavrothal... couldn't we make that an 'if' statement? It surely would do no harm on cards that do behave, and then it would be automatic, maybe Mitch's advice is needed.
" Kingston 8G Datatraveler "
Horrible usb. I had issues 2 weeks ago. Finally the Hirens formatter loaded it. Posted: Sat 25 Sep 2010, 11:32 Post subject: PDEV1 paramater works. RC worked great with the 8G Kingston stick using the above!!! Just read the release notes again for XOpup-1.0_RC and need a little clarification. Does this mean we now know how to turn off the WiFi or does it just work in suspend mode? I was going to take my XO on a plane trip in about a week but I need to know how to turn off the wireless. Looks like overclocking is not being used by default on the RC as it was in versions v1-4, correct? 500Mhz CPU and 200Mhz bus speed is what was default on V1-4, correct? Powerd turns off everything in suspend and thus the wifi too. Obviously this can not be used as an "airplane mode". The problem is that Puppy has issues with rfkill (which is the proper method) and thus inactivated in Puppy-proper. Rfkill is included in the XO kernels but does not work properly. Thanks to Mitch Bradley's new Forth boot script, puppy does not need to figure out where is booting from (and occasionally fail). Open firmware just tell it very reliably! So even bad USB/SDcards (eg with long response times) can be used for XOpup. There is also a new kernel for XO-1. To the casual user does not make a difference but if you want to compile kernel modules or drivers, is important. Download from the top post of this tread.